Juventus simply cannot do without this mercurial 31-year old Argentine forward. It was his 13th minute goal in Turin against Borussia Dortmund that gave his club a 2-1 edge going into the second leg return clash at Dortmund. There were doubts cast as to how Juventus would shape up against a determined Borussia playing on their home turf. 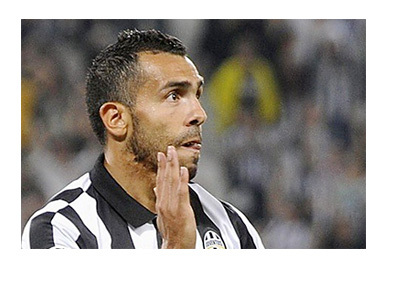 But Carlos Tevez just silenced the skeptics with an awesome show of goal-scoring power. Few would have thought of a 3-0 scoreline in favour of the visiting club. But Tevez just made that happen. He stunned a vociferous audience at the Westfalenstadion in the very 3rd minute smashing one in from 30 yards. After assisting Morata for Juve's second, he sealed the issue for his club in the 79th minute with a 18-yarder making it 3-0 and a aggregate of 5-1 in Juventus's favour. With this result, the Torino club will be the only Italian side to move into the Round of 8 of the 2014-15 UEFA Champions League. Tevez's second goal of the evening at Dortmund took his UEFA Champions tally for the season to six, which equals the club record for the tournament set by David Trezeguet in 2006. Tevez may be in line to surpass that, too. His season's tally for Juventus in all competitions stands at 23 goals and in 54 appearances for the Old Lady so far he has found the back of net 33 times. The Buenos Aires-born Tevez who caught the eye of many with his exceptional dribbling skills and an ability to score from long distances was signed over from Manchester City in 2013 at a fee of £10 million to the Turin-based giant. It was money's worth for Juventus as Tevez's tenure with Manchester City was no less prolific with him getting as many as 58 goals from his 113 outings for the English club. City were not very willing to let go off the striker but a savings opportunity of £27 million from his contract with Juventus was too hard for the English club to pass up. Tevez made his competitive debut in Italy on August 18, 2013 and was immediately among the goals scoring the fourth in a 4-0 Juve victory over Lazio in a Supercoppa Italiana clash. His first Serie A match for his new club also fetched him a goal with a winner in a 1-0 victory over Sampdoria. A hat-trick followed in December 2013 in a 4-0 thrashing of minions Sassuolo at the Juventus Stadium. 2013-14 saw him named as Juventus's "Player of the Season" after emerging as the club's top scorer with 21 goals to his credit. His 19 goals in the 2013-14 season helped the Turin giant become Serie A champs. His stamp on the Old Lady is getting stronger by the day. Juventus are at a daunting 64 points from 27 games in the 2014-15 Serie A season and have a huge 14 point lead over 2nd placed Roma. With the "Scudetto" (Serie A title) virtually in the bag, the Torino club can now fully focus on their European campaign, where UEFA Championship glory beckons. The brilliance and tenacity of Carlos Tevez can get them there.